If Bourgogne was the whore of the world, Daniel Lifshitz would be her Madame. 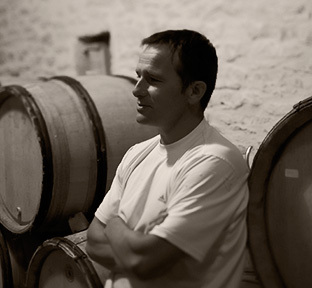 Here, he 'pimps' Domaine Benoit Ente, a tiny producer, tending about three and a half hectares in, mostly, Puligny. And out of these three and a half hectares, he ekes rich, yet ascetic, expressions of terroir and purity. 451 bottles. This is the domaine's only red wine, and it's a throwaway in a sense, as it would be a fine bistro wine if the quantities did not make it a scarce cult item. But if you do find it, you will get soft, comely red fruit, floral, lightly earthy, clean and tasty. 100 NIS. 438 bottles. A blend of Les Tremblots and Les Houlleres, which are top village plots. A detailed and complex nose, beyond my expectations from a village wine. I've been trying to avoid using mineral as a generic descriptor, but I can't pin down a specific rock - maybe that's chalk in there? A touch of flowers too. Balances salty and sour/sweet flavors. Elegant acidity. 320 NIS. 1188 bottles. A more obviously minerally wine, with lime fruit. For me, at least at this stage, it's less expressive than the Puligny, by a hair. But, it's much more elegant than I'd have expected Chassagne to be. This and the Puligny are lovely and pure village wines, stunning in how well they present the towns. 320 NIS. 387 bottles. The relevant comparison is to the village Puligny, of course, and what we get here is not necessarily more complexity as much as greater breadth and depth. And more mysterioso. On the palate there is not so much more body, but greater grip, I think, even though the structure is hardly oppressive. Like all the Ente wines, it is very pure with no sign of over-oaking. 470 NIS. 491 bottles. Expressive, yet restrained. Even when it opens to show more details and depth - flint, chalk, lime and apple skin - it retains that same restraint. An endless finish. Simply too delicious and interesting for its own good, or rather mine. 510 NIS. 672 bottles. Closed, very floral and tropical. In a way, it's the mirror image of the 2012, which hinted at these same floral and tropical notes beneath its shroud of minerals. Here, beneath the heady and ripe fruit are just hints, for now, of flint and the chalk. Takes a long time to show elegance. 510 NIS. 772 bottles. If the 2013 Champs Gain crouched behind a wall of tropical fruit, this wine is veiled by a canopy of minerals. There's a richness here even if the acidity knifes, salts and tests the palate. 700 NIS.